Fajitas were born of necessity. Mexican ranch workers in the 1930s and 19040s were given tough cuts of butchered steer as part of their wages. They learned how to make the best of chewy skirt steak by grilling it, cutting it into narrow strips and rolling it into a tortilla along with piles of fried peppers and onions. 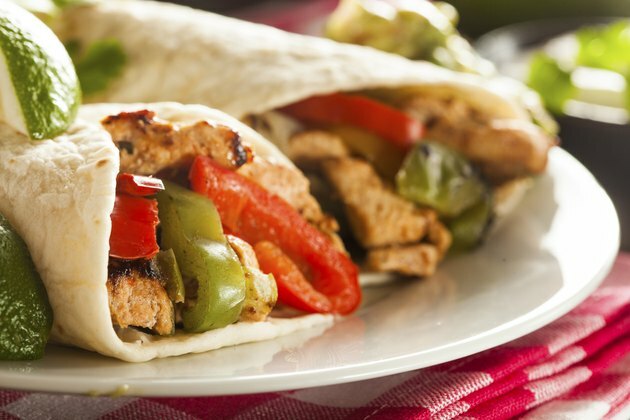 Nowadays, the meat in a fajita may be pork, chicken or different cuts of steak, but every fajita always includes a healthy portion of peppers and onions. Whether you fry them or grill them, cook the vegetables the same way you cook your fajita meat. Select multicolored peppers. Peppers of different colors have great eye appeal, but they also provide different flavors, vitamins and phytonutrients. For example, red peppers are a bit sweeter than the others and have lycopene, a powerful antioxidant. Select peppers that are firm and free of blemishes. Wash the peppers. Remove the stems, seeds and ribs. Rinse away remaining seeds. Peel the onions. Cut the peppers into 1/2-inch-wide strips. Halve the onion, and cut it into thin slices. Place the vegetables into a bowl and mix in 1 tablespoon of olive oil and garlic. Fry whatever meat you are going to use in your fajitas. Remove the meat to rest. Deglaze the pan with lime juice over a medium-high heat. Use a spatula to scrape and loosen any charred remnants of the meat that you fried. Add 1 tablespoon of olive oil to the skillet. Let it heat a few seconds. Add the pepper-and-onion mixture to the skillet. Sear the vegetables for one minute before you stir them. Then every 90 seconds or so, stir them, scraping the bottom of the skillet using the spatula. Sauté them for a total of five or six minutes. They should be soft and have a few charred spots. Remove vegetables from the pan to a serving bowl and cover it to keep the vegetables warm. Remove the meat from the grill and allow it to rest. Place the vegetables over an area of the grill where there is a high heat or set your gas grill on medium high. Sear the vegetables for a minute or two. If you grill vegetables routinely, buy a grill basket to prevent your vegetables from slipping between the grates and make moving them around easier. Alternatively, wrap them in tin foil so they lay flat. Use a fork to punch some holes in the tin foil. Turn down the temperature to medium or, if the vegetables are in a basket, move them to a cooler area of the grill. Close the lid and grill them for five or six minutes on medium heat. Remove the vegetables, place them in a serving bowl and cover them to retain the heat.